NEW! 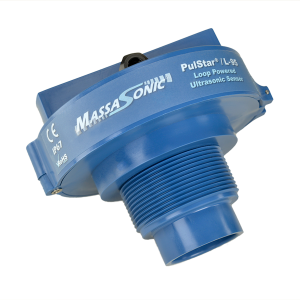 MassaSonic PulStar® Loop-Powered Sensors are ruggedly designed transmitting modules that provide reliable continuous level or distance measurement of fluids, pastes, or solid bulk materials. These sensors accurately operate at application ranges from 8 inches (200mm) to 20 feet (6m). Incorporating state-of-the-art ultrasonic technology and processing algorithms, all PulStar models provide precision non-contact distance measurement for applications such as Liquid Level, Distance Measurements, and more! PulStar L-95 Sensors include advanced diagnostics that will retrieve the ultrasonic waveforms for analysis and display them on a computer to aid users when evaluating complex installations. They are RoHS compliant, CE Certified, and IP67 Rated. These sensors are adjustable for averaging measurement, analog output slope, loss-of-echo time-out and detection sensitivity adjustment. Contact a Massa Applications Specialist to discuss your specific sensing needs.